My girlfriend requested me to recover a word file which is her 2 months of work :(, and this is her thesis for graduation. It shows the "Select the encoding that makes your document readable" screen when I tried to open it, I tried 2 recovery tools but didn't work. *****The history of the issue***** she said she was copy pasting from other files while creating this file(she copy pasted from a pdf too). 2 days ago she opened the file in company pc and worked on it. Wrote 2 pages and saved. Next morning she could not open it. it is possible that an error occured when saving. the computer she worked freezes sometimes , when she was working there was a file in usb she plug out and in it and continue to work. then saved. That file is (as far as I can see) more or less random garbage and doesn't resemble any file format I could recognise. I also ran it through a file(1)-like program which couldn't identify anything. So you're out of luck it seems. 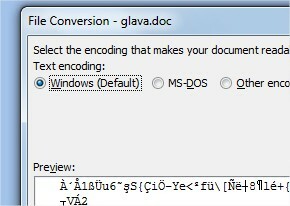 You could try asking Windows for a shadow copy (Previous Versions it's called) of that file, though. Not the answer you're looking for? Browse other questions tagged microsoft-word microsoft-office data-recovery file-recovery or ask your own question.